Pulitzer Prize Winning Photographer Kills Himself and Leaves Suicide Note About World Hunger-Truth! & Fiction! - Truth or Fiction? Pulitzer Prize Winning Photographer Kills Himself and Leaves Suicide Note About World Hunger-Truth! & Fiction! The eRumor includes a dramatic photograph of a starving child being watched by a vulture. 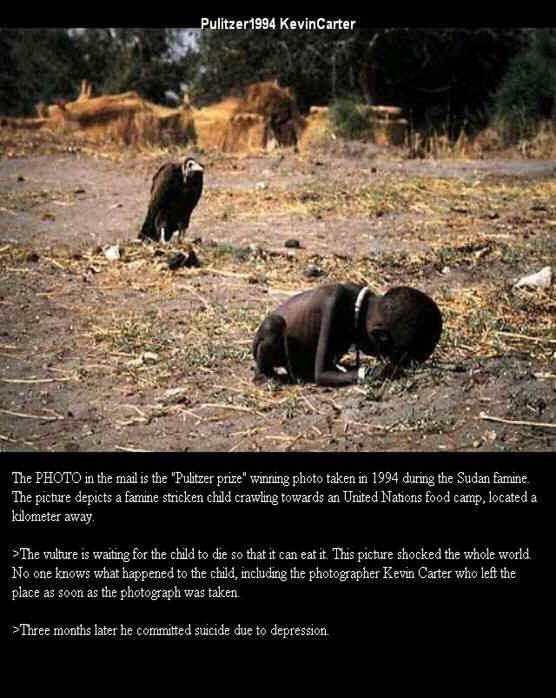 The email says that the picture was taken in Sudan 1994 by Kevin Carter who won a Pulitzer prize for it. The eRumor says he committed suicide three months later and left a note about world hunger. The picture is real as is the story of the photographer’s suicide, but the alleged wording of his suicide note is fabricated. Kevin Carter was a South African photojournalist. 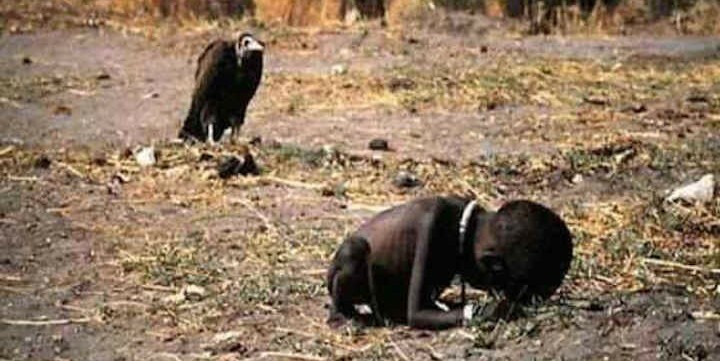 The picture of the vulture stalking a starving girl is real and was taken in Sudan in 1993. He was awarded Pulitzer prize in May of 1994 for the picture. Two months later he connected a hose to the exhaust pipe of his pickup truck and committed suicide. His long time friend Judith Matloff wrote in the Columbia Journalism review that Carter was the kind of person who seemed more affected by some of the violent events he photographed. She says that he would often return from upsetting assignments with bouts of crying, drinking, or using drugs. She says that after he shot his Pulitzer prize winning picture, he “sat under a tree and cried and chain-smoked” and couldn’t distance himself from the horror of what he saw. He was criticized for not helping the girl in the picture and said he did not know what happened to her. The eRumor includes a comment about world hunger that was created by someone along the way who decided to turn the picture into a lesson about not wasting food. Such wording was not included in Carter’s suicide note. Please don’t break.. keep on forwarding to our friends On this good day. Let’s make a prayer for the suffering in anywhere anyplace around the globe and send this friendly reminder to others “Think & look at this… when you complain about your food and the food we wasted daily……..